Little Red Dingo nuzzles Mummy's nose, Little Bilby tickles Mummy's ears with his whiskers, Little Sooty Owl nestles beneath Mummy's feathery wings... All the little animals have their own special ways of showing their love. 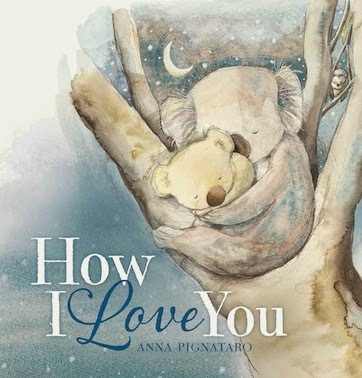 How I Love You would be an inspired choice for anyone who is looking for a children’s picture book gift for a baby shower, or for a little one who needs a gentle, calming and reassuring story for bedtime. I love the emphasis on ways mothers express love for their babies, the gorgeous Australian animal characters in muted pastel colours and the opportunities for littlies to copy the animals as they snuggle, nuzzle, nestle and cuddle with Mum.